When is a rash-guard something more than a rash-guard? Simple. It’s when the rash-guard is Ergo from PaddleAir. Over the years, we’ve received thousands of comments about how PaddleAir makes prone paddling comfortable. Indeed, the first time I used it I described paddling my longboard like I was driving a cabin cruiser. That simple pocket of air beneath the chest does wonders for the ribcage. And, it puts you in an ideal position for power. With five-mil Neoprene in the front, and the inflatable bladder, Ergo is a rash-guard and much more. Checkout it out. 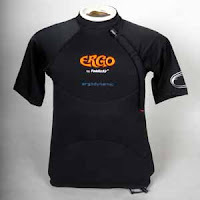 The ergo works great for rashguard. Even beter than the outsider.